We get many questions about our bulk materials at Vineyard Gardens and thought it would be pertinent to bring all the information together in one place. Good soil is critical to successful gardening. What we see above ground is really only half the picture. If a plant's leaves are turning yellow or if pests are suddenly present you can bet there’s a problem with the soil. One of the most important ingredients in soil is its organic content. It is the organic content that, in the process of breaking down, enable the roots to access moisture and nutrients. Every year we have to build up the organic content of the soil to keep plants growing and healthy. Once we have added the organic material we need to keep it from drying out and prevent weed seeds from moving in, so we use mulches to protect the investment. We have two groups of bulk materials; organically rich soil amendments and mulches. The main ingredient in our soil amendments is compost. Gardener’s Choice is an organic leaf and yard compost. It has been heat treated to render it relatively weed free. It is the best choice for vegetable gardens but it is also ideal for top-dressing flower beds. $65/cu.yd. Earthlife Compost is a heat treated Bio Solid compost. The heat-treating kills off most of the weed seed. This is a commercially produced material that has been thoroughly checked and approved for sale by our local Board of Health. It is an excellent choice as a soil amendment to bring up the organic content of our poorer Vineyard soils and to lighten heavy clay soil. $60/cu.yd. This product is super versatile and useful. It can be used as an amendment when planting trees and shrubs. It can be used to top-dress gardens that have particularly difficult components, like clay or sand. It can be lightened with perlite to use as a potting mix. $65/cu.yd. 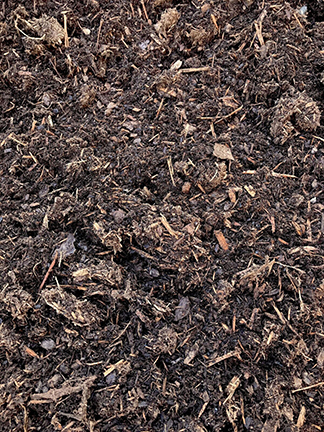 We use our standard Pine Bark Mulch for most gardens, shrub boarders and tree wells. 55/cu.yd. We also provide Wood Chips which is perfect for suppressing weeds in uncultivated areas like paths, parking spaces, construction areas. It's best not to use wood chips in planted areas because the fibrous material has not broken down yet and in the process of breaking down it burns Nitrogen. Nitrogen is an important nutrient for plants and without it growth will be weak and lacking in chlorophyll turning the leaves yellow. It is useful for suppressing weeds when its freshly put down. $20/cu.yd. Click on this LINK for a handy calculator to help figure out how much of these materials you’ll need for your project.